Last month's haze prevented us from going out and so it has been 3 weeks since we last saw Mum. So yesterday we went over to Bro's house for dinner. The cousins were happy to gather together and after dinner they decided to have a game of Twister. The 3 younger ones were having a blast of time trying to balance themselves while me & sis were laughing so hard till our sides hurt. We saw them in different weird, awkward and difficult positions but this one is the most difficult one. "This one is like the split we have to do during wushu (martial art) training!" Ah~ lucky for you son because you won that round of Twister. I'm amazed that the kids are able to twist or stretch their limbs and body to such extend. Don't they feel the aches, the pain???? Well, one thing's for sure, its a tiring game as they decided to end it just after 5 games, declaring that "this is a BORED game!" Guess nobody wants to admit that they are feeling the aches and pain huh. Wow! What flexible kiddos! I love to play Twister and will have to pull our set out, too! Bring it out, its guarantee to be fun for every one. They twist they turn they do the stunts, amazing I tell you! There are times in my yoga class when I wonder if it wouldn't just be easier to put a twister mat on the floor! hahahhaa~ yoga and twister that'll be a fun yoga lesson! kids are flexible! i've been trying to get my hands on the twister game and to have people play with me!!!! HA! Get Blake to play with you when he is older! Happy Sunday! Stopping by from the UBC and Facebook! Wow, does this bring back memories - I remember playing Twister as a kid - then watching my kids play it! It's a great way for kids to get exercise, improve flexibility, improve eye-to-hand coordination, and distinguish colors! I've never tried this but your photos make it look like a blast. Great pictures. I've never tried this too, not going to try it now kekeke~ will leave this to the kids. 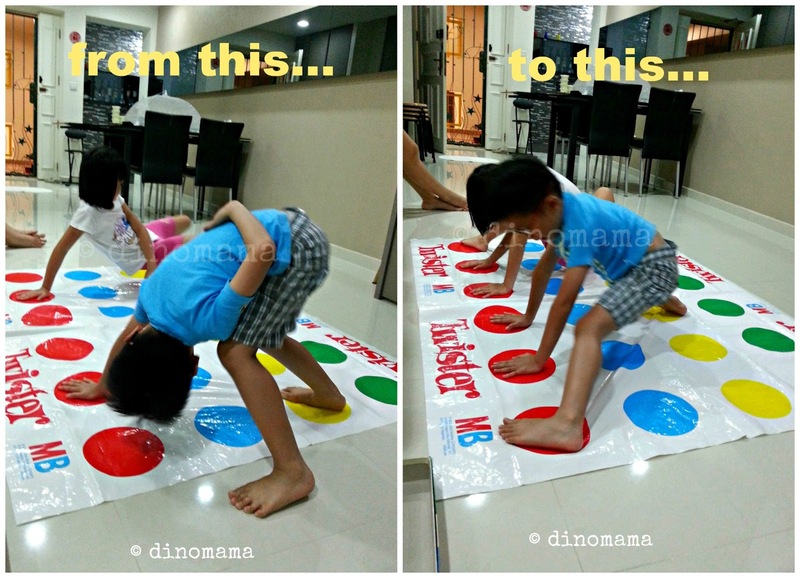 hi hi Dinomama, may I know where I can get this Twister game? Might be time to Twist the kids around, or the poor parents.